Liam Fontaine will be the first to admit it won’t come anywhere close to rivalling Sunshine on Leith, the Proclaimers’ song widely recognised as being one of the best-ever football anthems and one immediately associated with Hibs. 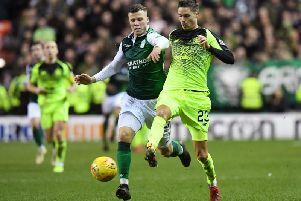 But the Easter Road defender has found his own little ditty Coming straight out of Leith is proving almost as popular among his team-mates, so much so he’s planning to have it professionally recorded. The song, the result of Fontaine “mucking about” on his guitar, was never meant for public consumption but a clip posted on Twitter of him playing it by team-mate Marvin Bartley has attracted attention from far and wide – and not a little critical acclaim. Having sat down to discuss the new contract he’s just signed to extend his stay in Edinburgh to a fourth season, Fontaine admitted he knew it was only a matter of time before his budding career as a singer/songwriter was broached. The 31-year-old said: “Playing the guitar is one of my pastimes. One day when I was bored, I needed something to do, so I began to teach myself the guitar. “I muck around just to switch off and one day I got a little rhythm going, came up a chorus and built a song around it. Fontaine’s effort suddenly found a much wider audience then he ever intended when Bartley got hold of his phone and posted the clip on Twitter. Fontaine said: “I’ve had quite a positive response from the fans which is obviously good for me. Marv put it out there but I’m the one who has to deal with it. You are up there to be shot down. “Your closest mates are always your biggest critics but obviously we’ve not been in together over the past couple of weeks. But I’ve had a few messages, a couple asking ‘what are you doing’ and a couple saying it’s all right. “I actually bumped into Lewis Stevenson who likes his music in the street yesterday and the first thing he said was he liked it. Now Fontaine is hoping Neil Lennon’s side remain on song as they prepare to return to the Premiership after a three-year absence, the former Bristol City defender becoming the latest in a long string of players who were out of contract at the end of last season to have pledged their futures to the club. The fact the likes of Gray, Darren McGregor, Bartley, Stevenson and Ross Laidlaw had already committed was, he insisted, evidence aplenty of the tightly-knit dressing room at Easter Road. He said: “We all got told early on that we were going to be spoken to about new deals and my intention was always to stay. “I’m just very happy here. We’ve been on a good thing since I came in, to be fair. We’ve been on a steady incline. We’ve had the disappointment of it taking three years to get back up to the Premiership. “But I think from where we were we’ve had to build throughout those three years with Leeann [Dempster, chief executive], George [Craig, head of football operations], the previous gaffer and the current gaffer, we’ve been on a steady incline. “We’ve had the Scottish Cup in there as well and I think there’s a lot more to come from us. Without doubt it’s also down to us being such a tight-knit group. That’s the one thing you always hear from whoever you speak to in our team, how close we are as a bunch. Fontaine, fit again after needing an operation on an ankle injury which brought his season to a premature end, knows he faces stiff competition for a place in the coming season with Paul Hanlon also returning from a lengthy lay-off to join McGregor and Jordon Forster in the fight for the central roles in defence, while Lennon is still hopeful of bringing emergency loanee Efe Ambrose back to Easter Road on a permanent basis. He said: “We’ve had that competition, the season before last we had Niklas Gunnarsson. We’ve always had it and I think it helps. When we do want to change our shape we can go from a four to a three and have three centre-backs who can go in there. “Last season Paul was injured and then I was unfortunate to get injured as well, so you need cover at all times. You never know what is going to happen in a season and that’s the reason the club builds such a strong squad. Lennon has made it clear he doesn’t intend Hibs to return to the top flight merely to make up the numbers, the Easter Road boss insisting after the narrow Scottish Cup semi-final defeat by Aberdeen that his players had what it takes to be second best to a Celtic side who will be overwhelming favourites to take the title yet again before a ball is even kicked. And Fontaine insisted he has no worries about meeting that challenge thrown down by his manager, saying: “We always have a high expectation on ourselves. “I think it’s good to pay under that pressure. We’ve shown in the last two seasons, definitely, that we can compete with teams in the Premieriship because we had to play a lot of them in our cup runs, last year especially. “Certain teams are going to rebuild this summer – Hearts and Rangers definitely – but when we played Hearts we dominated them so we’re looking to getting the derbies going again next season.